Steven Clifford, 75, is a former president and CEO (1987-1992) of the Seattle-based radio-TV media conglomerate King Broadcasting Company; a former chairman (1992-2000) of Los Angeles-based National Mobile Television; and author of the book CEO Pay Machine: How it Trashes America and How to Stop it. He is currently secretary and trustee of Seattle Biomedical Research Institute, and writes trite little columns that he thinks to be amusing for Huffington Post. On October 30, 2018, after speaking at a forum on destroying market fundamenalism organized by the Center for Study of Responsive Law founded by Ralph Nader in 1968, Clifford told PJ Media that the right to vote should be taken away from heterosexual white males as a way to “save” democracy because a majority of them had voted for Donald Trump in 2016. “I’m not a campaign consultant and I think they [Democrats] have to get off the fact that Donald Trump is Donald Trump. Every voter knows that Donald Trump is Donald Trump. Hillary Clinton spent $450 million every day saying that Donald Trump is Donald Trump. I think they’ve got to tell the voters why they’re going to be better off with a Democratic House or a Democratic Senate rather than just say Donald Trump, Donald Trump, Donald Trump every day… ‘Anti’ doesn’t get people out to vote enough. It’s got to help me…. I think this is a loose translation of “Ein Volk, Ein Reich, Ein Fuehrer” but my German is not very good. 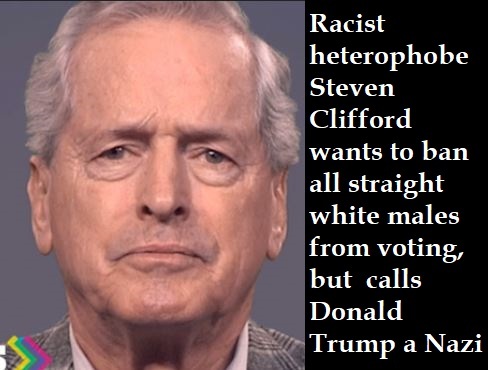 So Clifford advocates banning straight white males from voting, which is racist, sexist and heterophobic, but he calls Trump a Nazi. Oh, the irony. We know what Trump thinks of Mexicans. What if the pearly gates are not guarded not St. Peter but by Quetzalcoatl, and Huitzilopochtli is the big Kahuna. We could be in big trouble…. Even with demanding human sacrifice, Huitzilopochtli doesn’t look so bad. Baal, Marduk or Thor would be a big improvement. Since Steven Clifford, by his own description is an “old white man,” and since I very much doubt he is advocating banning himself from voting, I can only conclude that Steven Clifford is a homosexual. So if you are a heterosexual white male and you are thinking of not voting next Tuesday, you may lose your right to vote in the future. This entry was posted in 2016 Election, 2018 midterm elections, Culture War, Donald Trump, Evil, Gay Fascism, God, Hillary Clinton, LGBT, Liberals/Democrats/Left, Media, Satanism, Trump Derangement Syndrome, United States, US Presidents, war on Christianity and tagged King Broadcasting Company, Seattle Biomedical Research Institute, Steven Clifford. Bookmark the permalink. this article is interesting because we are continually told by the America, Christian, & White hating MSM, that “White” people are in power. Looks like the “White” people controlling the lying MSM are chameleons pretending to be White, but are not. Democrat Icon Louis Farrakhan calls these pretend White people “Termites” (((destroyers))). It’s the ignorant ones that should be banned from voting. I wonder what’s hiding behind his “proclamation”. Sounds to me there’s a “weakness” for white males, does he like them that much he resents them? Gay undertones, ain’t? Not a day goes by that the left does not reveal its true nature to us. It’s packed wall to wall with stupid people. So the only way to “save democracy” is to abolish democracy and institute discrimination based on race, gender, and sexual orientation (all federally protected classes)? 1984 called. They want their New-Speak back. Wonder if this guy lives amongst the homeless in Seattle? Did he share his CEO pay for the sake of equality? I’m guessing a big fat no. I would be happy to carry out his castration because it is obviously what he wants. How about a dull spoon. Dear God, Give people like Steven Clifford, Ebola or Flesh eating bacteria… The world will be a better place for it. How about banning brain-dead democRATs, illegals, and crybaby liberals from voting. I guess I should be offended but my snowflake barometer is off today… All I can do is shake my head over idiots like this moron…. A bumper sticker I saw summed it up perfectly…. “If I wanted to listen to an A-hole I would FART”….. The unfortunate thing is he is presently counted among us. why aren’t these people under arrest? ‘Seinfeld’ actress hyperventilates Trump America is going Nazi, but ignores the Left’s 640 acts of violence & harassment – Connect to Everyone!